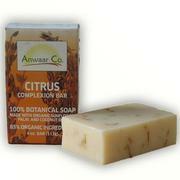 Nourish your skin with the natural lather of Anwaar's Citrus Complexion Bar soap. Natural citrus oils gently cleanse delicate skin and are thought to help restore proper balance. This soap is the ideal daily cleanser for all skin types, especially dry, sensitive skin. Start the healing today. MADE WITH PURE CITRUS ESSENTIAL OILS TO GENTLY RESTORE AND CLEANSE. All natural ingredients: saponified oils of sunflower, palm, coconut and olive (with retained glycerin); pure essential oils; shea butter; calendula petals; grapefruit seed extract; rosemary extract.